A bed is an absolute necessity for everyone and is a huge part of our homes. Our luxury designer beds are made to give your bedroom a royal and majestic touch. Built to provide you with the ultimate comfort and support. Give yourself and your guests an unforgettable experience by allowing Robson Furniture to transform your home into a palace. Our glamorous beds are available in various different sizes. The common sizes available are double, king size and super king size. If you are wanting something even bigger, call us and we will make a custom bed for you with your own specifications, sizes, materials, colour’s and finishes. Our luxurious beds range from traditional and classical all the way to contemporary and modern designs. Made using the highest quality materials and upholstered in beautiful fabrics and leathers. When being manufactured. Attention is paid to each detail ensuring that nothing but perfection is achieved every time. Each bed is carefully made by hand and no two pieces are ever alike. What’s even more exciting is that all of our beds are accompanied by matching bedroom furniture. So treat yourself to an entire package deal for your home. Robson Furniture now offers international shipping so no matter where in the world you are, we can cater to your every need. We only stock high end luxury furniture from world famous designers and manufacturers. Our high end beds are built to make a loud statement. If you are looking for something truly unique and out of this world, then you need to take a look at our luxury round beds which are available in many sizes and materials to match your requirements. Most of our beds are manufactured in in Italy and France using some of the most mind blowing designs. Be amazed at the beautiful designs of luxury beds which are available on our website. Each bed in this section is designed to fit into every setting perfectly. Our luxury leather beds are amongst the best sellers as they offer various colour options. The most common colour’s are black, white, brown and cream leather designer beds. However, you can select your own colour and we can make your bed for you. You can even select the type of leather you would like. We have everything from high quality faux leather to ultra soft genuine leather for a luxurious feel. If leather is not what you’re after, you will definitely fall in love with our luxury fabric beds. Upholstered in beautiful fabrics like velvet which add glamour to your bedroom. Handmade by skilled craftsmen with generations of experience. Our personal favourite is the beds with tufted and buttoned headboard designs. You can also have little crystals inserted into your bed designs. Made in Italy by some of the best manufacturers. 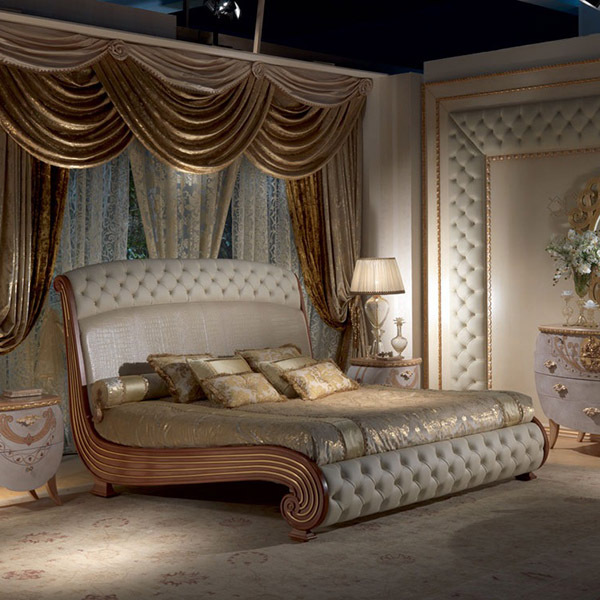 Luxury Italian beds are becoming more and more popular each day.